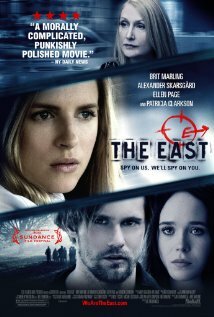 Starring Brit Marling, as Sarah, an undercover security agent for an elite private intelligence firm. Her priorities quickly change when she is assigned to infiltrate an environmentalist group engaged in attacks against major corporations for their cover-up crimes against humans and nature (pharmaceutical, water pollution, oil spills). Another actor in the movie, Alexander Skarsgard is awesome as the leader of the anarchist group. I saw him in the recently released movie “What Maisie Knew.” I highly recommend this movie.